B-O-F Corporation, known for its gravity flow (also called gravity feed) shelving solutions, has served the retail grocery industry since its founder, Edward Knorring, first began his entrepreneurial start in 1953. The company’s reputation as an advisor to, and collaborator with, retailers who sell milk, dairy, and cold beverage products is a result of its relentless quest to meet the grocery industry’s requirements to deliver cold dairy and beverages safely and attractively to consumers. Today, B-O-F is a leading inventor, patent-holder and designer of innovative gravity flow shelving products that help grocery stores, drug stores, liquor stores, and convenience stores sell more dairy and beverage with fewer labor costs. Mr. Knorring started out as a manufacturer’s representative offering merchandizing products, including conveyors, shelving, and other material handling items, to the grocery industry. With the emergence of the supermarket, Mr. Knorring saw a niche for better, more efficient, more attractive product delivery systems at the retail level. Through acquisitions, the company continued to expand and acquire more knowledge about and access to a variety of products for the grocery industry, including carton cutters, glass doors, and gravity flow shelving. By 1982, the company began manufacturing a gravity flow shelving product through a division named Bev-O-Flow. The success of the gravity flow shelving system was rapid. The product alleviated labor pains associated with stocking shelves in a neat and efficient manner. It allowed retailers to put more product at the consumer’s fingertips with less labor. It also enabled retailers to enhance merchandising aesthetics which increased sales for retailers, leading to more growth for B-O-F. Within five years, the company adopted the name B-O-F Corporation and dedicated itself exclusively to perfecting and marketing gravity flow shelving systems with innovations designed for specific product types such as milk and dairy products, cold beverages and, the newest craze, single serve items sold through convenience stores. By 1987, improved safety requirements for the delivery of dairy products resulted in the introduction of The Milk Moover®, an immediate marketplace success story for dairy retailers. The development of The Milk Moover is an example of how every product developed by B-O-F is a direct result of the company’s close connection to the manufacturers and package designers of food and beverage products, and the retailers who sell those products. By the 1990s, B-O-F was the undisputed market leader in gravity flow shelving, with innovation as a driving force of the company’s development. The dozens of patents it has been awarded, and the hundreds of trade secrets it owns are the culmination of a corporate evolution that began in 1953. As the market continued to evolve and shift more towards single serve, B-O-F Corporation adapted in response. Our new VersaSlide® product line is a direct response from retailers for today’s merchandising problems. VersaSlide is quickly becoming the go-to solution in convenience store chains across the US for single serve. The company is staffed and run by professional and dedicated employees, including members of the original Knorring family. B-O-F corporate leaders have in-depth consumer packaging and retail experience. Some B-O-F employees have spent their entire careers at B-O-F, creating a knowledge stream that is unsurpassed in the industry. Interested in Learning More About B-O-F? 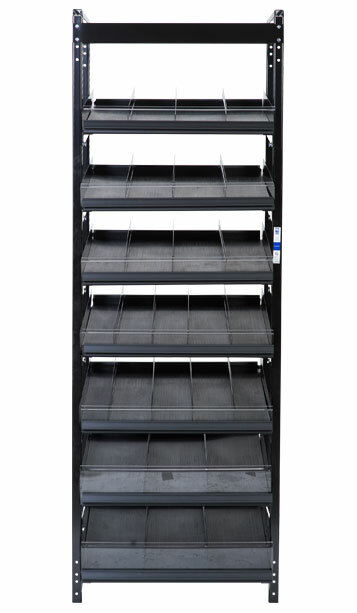 Contact us to find out how we can help you reap the rewards of gravity flow shelving.